Archaeologists are frequently surprised by unexpected discoveries when researching sites. At the Bowen's Prairie townsite (13JN152), they encountered one of the most surprising of the field season. 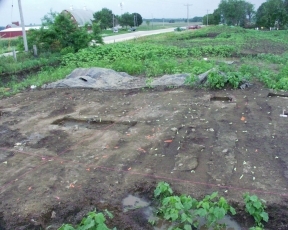 The foundation of a large structure emerged in the southeastern portion of the excavated area just north of U.S. Highway 151. It appeared as a series of 15 evenly spaced rows of limestone rubble each running in an east-west direction. Each row was approximately one meter wide and was separated from the adjoining row by a space approximately 30-40 cm in width. Few artifacts were present. Consultation with historic archaeologists and architectural historians suggests that it may represent the rammed earth foundation of a large building. Rammed earth construction, a new innovation in eastern North America in the 1850s, had been used in the Old World for centuries. At Bowen's Prairie, the rows of limestone rubble probably represent the remains of fill packed into a series of narrow ditches to form the support for a timber superstructure. The fill was typically watered down and tamped to provide a solid foundation perhaps half a course in height. Wooden joists and floor were laid over top. The empty spaces between the rows possibly offered ventilation to a granary above. 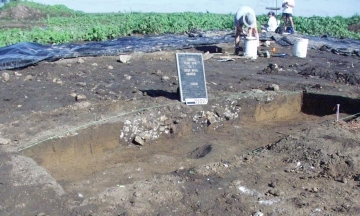 Soil samples removed from the feature will be analyzed for the presence of plant remains such as charred seeds, which could confirm the proposed function of the structure.